Provide remedial responses and/or provide oversight to the uncontrolled releases of hazardous and petroleum substances into the environment. PDEQ also provides information on disposal of other solid wastes and the unlawful storage of solid waste on private property. Including mobile homes, manure, animal feces, medications and needle (sharps) disposal. There are many options available to dispose of solid waste within the PIma County area. If you live outside the City of Tucson limits, you will need to either hire a solid waste hauler to pick up your garbage and recyclables or self-haul to a solid waste disposal facility. A list of solid waste haulers permitted by Pima County is available on the "Waste Programs" tab below. Information on Pima County-owned landfills and transfer stations and those owned and/or operated by other governmental entities or private sector companies is available below. In that same tab is information on disposal options for Household Hazardous Waste. Effective June 1, 2013, Pima County entered into a contract with Tucson Recycling & Waste Services (TRWS) to operate the County’s landfills and transfer stations. The Sahuarita Transfer Station was opened at the Sahuarita Landfill on February 1, 2016. The transfer station is at the same location (16605 S. La Canada), has the same hours and accepts all the same materials as the landfill. 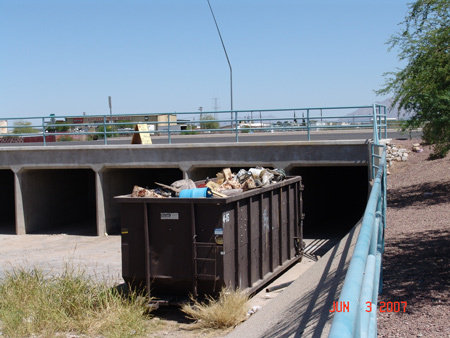 The PDEQ Solid Waste Division provides public facilities for the safe and sanitary disposal of solid wastes generated within the Pima County jurisdiction under authority from the State of Arizona (ARS 49-741). Further, the State of Arizona (ARS 49-742 et. seq.) allows the establishment of solid waste user fees to cover the costs of development, construction, operation, administration, and financing of public solid waste management activities, and broadly controls those activities. Ajo residents may apply for the landfill discount at the International Sonoran Desert Alliance Ajo Works office located at 321 E Taladro, Ajo, AZ. Walk in hours are on Tuesday and Friday between 9:00 A.M. and 4:00 P.M. Appointments for other days may be scheduled by calling the office at 520-387-3570. List of Active Municipal Solid Waste Landfills and Transfer Stations in Pima County including ownership (not all landfills are owned by Pima County), locations, phone numbers, website links and driving directions. There are landfills in Pima County that accept only inert materials, including green waste, construction and demolition debris. Check the internet or phone book listings for additional waste disposal and recycling information. Illegal dumpers often add their garbage to an existing pile of trash. Removing it promptly reduces additional dumping. There is no excuse for dumping anywhere except at an authorized landfill or transfer station. All of us pay a high price for the dumpers’ illegal behavior. YOU CAN HELP STOP ILLEGAL DUMPING! 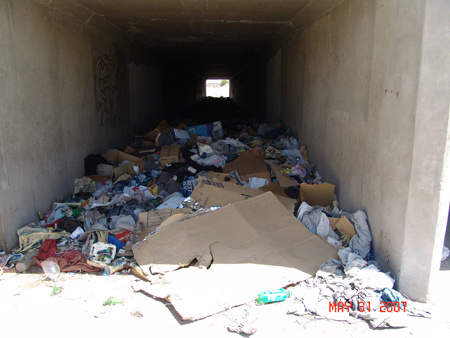 Report illegal dumps to PDEQ online or by calling (520) 724-7400 Mon-Fri, 8am-5pm or (520) 622-5800 (24 hours/day). Never approach an illegal dumper. If you see illegal dumping activity in progress, report it immediately by calling 911. Then call PDEQ with location, license plate number, vehicle description, or other identifying information. Illegal dumps are eyesores, pose serious health and safety threats, and are costly to us all. DON’T BE A SECOND-HAND DUMPER. Ask for a landfill receipt before full payment. Free, or low-cost, disposal is available for many items including household hazardous waste. Appliances and furniture can be donated to charities and neighbors for reuse. It is unlawful to dump, deposit or dispose of solid waste any place within the county other than at an approved site. PDEQ also provides information on disposal of other solid wastes and the unlawful storage of solid waste on private property including mobile homes, manure, animal feces, etc. The Pima County Department of Environmental Quality (PDEQ) Waste Hauler Program is authorized to inspect septic tank cleaners (a.k.a. liquid waste haulers, pumper trucks) and solid waste haulers on an annual basis. Prior to operating in Pima County, waste haulers shall apply for and obtain PDEQ licenses for their business, and for each vehicle used for liquid and solid waste collection and transportation. 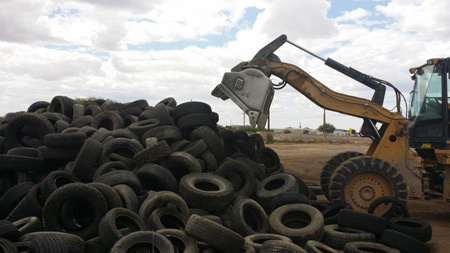 The Pima County Waste Tire Program is operated at the Pima County Waste Tire Collection Site. The WasteTire Collection Site is located at 5301 W Ina Road at the temporarily closed Ina Road Landfill, west of I-10. The facility is operated by CRM of America who transport the waste tires to their manufacturing plant in Queen Creek and shred the tires for use in the production of rubberized asphalt, artificial turf, sports tracks, decorative landscaping and playground mulch and other rubberized molded products. The primary goal of the PDEQ Hazardous Waste Program is to encourage the conservation of natural resources through resource recovery and waste minimization. PDEQ inspects all hazardous waste generators and hazardous waste complaints in Pima County for regulatory compliance. Household Hazardous Waste, or HHW, are products labeled toxic, danger, poison, flammable, etc. These are potentially harmful to people, pets and the environment. They should never be poured down the drain. If you are like many residents, you don't want to throw these materials away but aren't sure what to do with them. They usually sit stored in a garage or shed. The City of Tucson HHW Program is free to all City of Tucson residents. A drop-off fee of $10 will be charged to residents living outside of City of Tucson city limits. Through the HHW Program, residents can drop off their materials and they will be safely recycled, reused, or disposed of properly. In addition, household hazardous wastes such as antifreeze, batteries, oil and paint, along with recycling items such as a variety of plastic, paper, metal, etc., can be disposed of for free at the Pima County owned landfills and transfer stations. The PDEQ Solid Waste Code Enforcement Program is authorized to inspect private properties outside the City of Tucson city limits for violations of the solid waste ordinances in Chapter 7.29 of the Pima County Code. Solid Waste, under Arizona state law includes: “garbage, trash, rubbish, waste tires, refuse and any other discarded material. The open storage of excessive material that cannot be considered “Solid Waste” i.e. the material is still useable or has value to the owner, is not under PDEQ authority and should be reported to Pima County Development Services for investigation as an Open Storage, Zoning violation. Proper disposal of solid waste can depend on the type of waste. For more information on waste accepted at Pima County Landfills see the "Landfill Information" tab above. PDEQ also provides information on Waste Reduction (Recycling) (tab above), Illegal Dumping (tab above), and on the Disposal of Other Solid Wastes. The Small Business Waste Assistance Program (SBWAP) provides a safe and affordable disposal/recycling option for your business’s hazardous waste. SBWAP is part of the City of Tucson Household Hazardous Waste Program and is operated by the City of Tucson Environmental Services Department. Of course you recycle. But do you also look for and purchase items that are made from recycled materials? That is the best way to complete the recycling loop and save resources for our children and grandchildren. There are considerable environmental and economic benefits associated with recycling, according to the U.S. EPA. Recycling helps create jobs, reduces the need for new landfills, saves energy, supplies valuable materials to industry, and significantly boosts the U.S. economy. By reducing waste in the first place, recycling everything you can, and keeping your eyes open for items made from recycled materials you will help the economy, the environment, and all who share this planet. Household Hazardous Waste - The City of Tucson HHW Program is free to all City of Tucson residents. A drop-off fee of $10 will be charged to residents living outside of City of Tucson city limits. In addition, household hazardous wastes such as antifreeze, batteries, oil and paint, along with items to be recycled such as plastic, paper, metal, etc., are accepted for free at the Pima County owned landfills and transfer stations. Home Composting In the Desert - The Tucson Organic Gardeners guide to home composting in the desert. Recycling Electronics and More - Discover recycling opportunities for a variety of items in the Tucson Clean and Beautiful Recycling Directory. Check with your provider for cell phone recycling options. Waste haulers operating in Pima County are required to offer recycling collection to their residential customers. The City of Tucson operates Neighborhood Recycling Centers. Recycling is also offered at Pima County Landfills and Transfer Stations through Tucson Recycling & Waste Services. How to dispose of Compact Fluorescent Light Bulbs (CFLs). For donation of unwanted vehicles please contact your favorite non-profit organization to see if they accept vehicle donations. PDEQ also provides information on disposal of other solid wastes and the unlawful storage of solid waste on private property. Including mobile homes, manure, animal feces, etc. American Lung Association (520) 323-1812 Donate unwanted vehicles to promote clean air and support the fight against lung disease in Southern Arizona. Other charities also accept donations of unwanted vehicles. Freecycle aims to keep items out of landfills by providing an internet listings service to help people give unwanted items to someone else for free. Keeping stuff out of landfills helps build a sustainable future, is good for the environment and builds local and world communities. Freecycle (officially known as The Freecycle Network) is made up of thousands of groups with millions of members across the globe. It's a grassroots and entirely nonprofit movement of people who are giving and getting stuff for free. Freecycle groups operate in specific towns or areas - so it's local as well as global.